As 2009 is slowly moving toward its end, we follow up our most pirated movies chart by taking a look at the most pirated games of the year. Call of Duty: Modern Warfare 2 is the absolute winner on the PC and Xbox 360, while New Super Mario Bros. scoops the title of most pirated Wii game of 2009. Call of Duty: Modern Warfare 2 broke records this year as the biggest ever entertainment launch in history. With 4.7 million units sold in the US and UK during the first 24 hours, it pulled in revenues totaling $310 million. In five days the game’s worldwide sales climbed to $550 million, crushing previous record holders Harry Potter and the Half-Blood Prince (only $394m) and The Dark Knight (just $203.8m). “In just five days of sell through Call of Duty: Modern Warfare 2 has become the largest entertainment launch in history and a pop culture phenomenon,” Activision CEO Bobby Kotick said commenting on the game’s success. This is, of course, reflected in the number of pirated copies being traded on BitTorrent. With 4.1 million unauthorized downloads of the PC version alone, the game more than doubles the achievement of last year’s ‘winner‘ Spore. 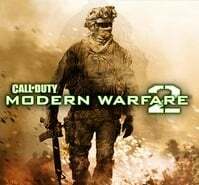 Modern Warfare 2 leads both the PC and Xbox 360 lists, by a landslide. The overall trend across all platforms is that, unlike last year, all of the games are 2009 releases. What makes Modern Warfare 2’s chart-topping even more impressive is that this has been achieved after just two months of availability. We further see that the figures for the most downloaded titles have more than doubled compared to last year, equaling the growth in uTorrent users. PC games are by far the most downloaded titles, with on average more than three times the number of downloads compared to Xbox 360 and Wii releases. As expected, Mario titles are in high demand on the Wii. c There are 153 comments. Add yours?